Visual Learning Systems is an online Science program for grades K-12. For this review, I was given access to all the levels, including Digital Science Online: Secondary Edition (Grades 6-12), but focused mainly on the Digital Science Online: Elementary Edition (Grades K-5), which includes Primary (K-2) and Elementary science (grades 3-5) which has been perfect for my first and fourth grade kiddos. 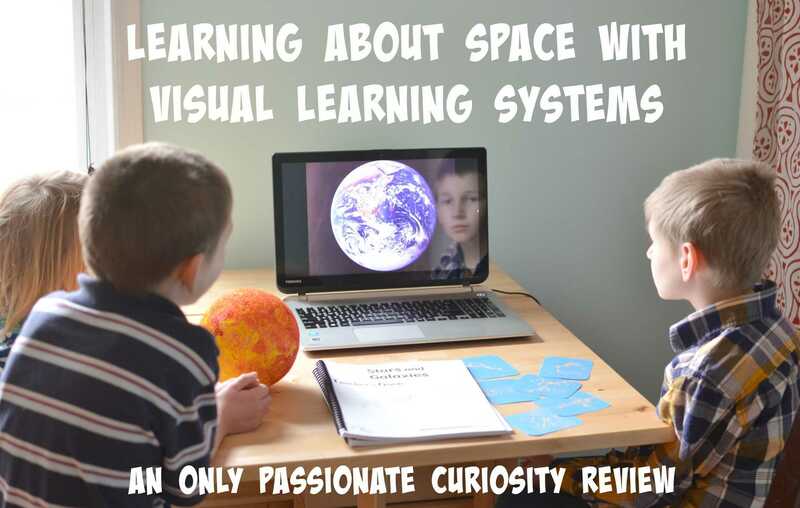 What Does Visual Learning Systems Include? 2. Animations: Some of the more difficult concepts are illustrated with animations to help kids really visualize the topics as they are learning. 3. Images: Each lesson contains a whole collection of images you can use to give your children more examples, or give them additional information for further research. 4. Teachers Guides/Student Materials: Each topic includes a 25 page PDF guide, with pre-tests, post-tests, vocabulary activities, worksheets for the cideos, writing lessons, and hands on activities. I don’t want you to think that because this is an online subscription, your child will spend a lot of time in front of the screen. That’s not the case at all. Visual Learning Systems is comprised of two main parts; the video lesson, which is 10-15 minutes long, and the downloadable Teachers Guides. The Teachers Guides contain the “meat” of this program. 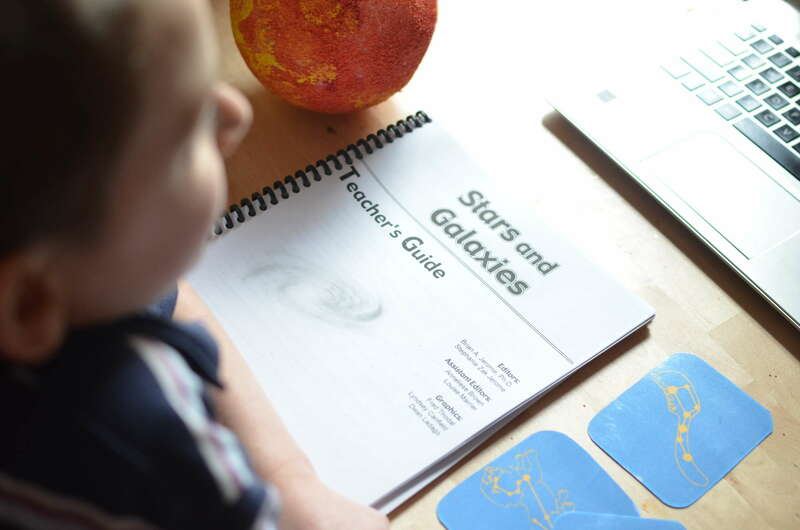 Each teachers guide has worksheets, a video review, writing activities, vocabulary lessons and hands on activities. These guides will help you take the videos, which are fabulous, and work them into complete units. You can take quite a bit of time with each unit, exploring the content and completing the activities. This is a complete curriculum, with plenty of expansion activities to keep your kids busy outside of the time they spend in front of the screen. Since we have been on a Space kick this month, I had the kids focus on the Space themed units in the elementary level. In the past four weeks, they have completed units on the planets, the sun and stars, and the earth and moon. These lessons were written for Bug’s age, but I was able to easily adapt the program to include all of my students, even the preschooler. We completed about one unit a week. On the first day, I would have Bug do the pre-test, then the kids would watch the video lesson, and then I sent them to go look for books in our home library to reinforce the concept. I had Bug then read over the video script (included in the PDF materials) with a highlighter so he could take note of the main ideas. 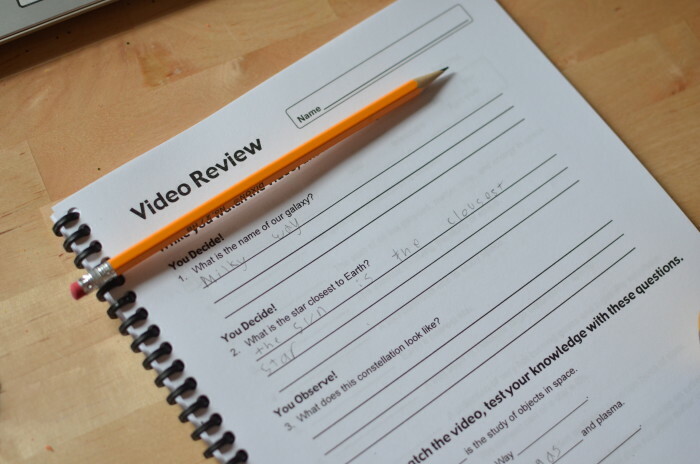 On the second day, I had the kids watch the video again, but I had Bug keep the worksheet for the video in front of him, and he worked on it as he watched. We discussed the video as a family so the Little Kids could try their hand at the answers. Then, Bug did the vocabulary worksheet. On the third day, I had Bug and Mr. Man tell me back what we had learned this week, and we completed the writing assignment. On the fourth day, the kids got to do the hands on activity. The hands on elements are always the kids favorite part. One activity had us learning about craters on the surface of the moon, so we experimented with dropping round objects of various weights and sizes from different heights to see what kind of impressions they would make in flour (the instructions called for doing this in dirt, but because it is winter and we were stuck in the house on my carpet, flour it was). Another hands on activity used string and pins to show the kids how gravity causes planets to rotate around the sun not in a perfect circle, but in an elliptical orbit. 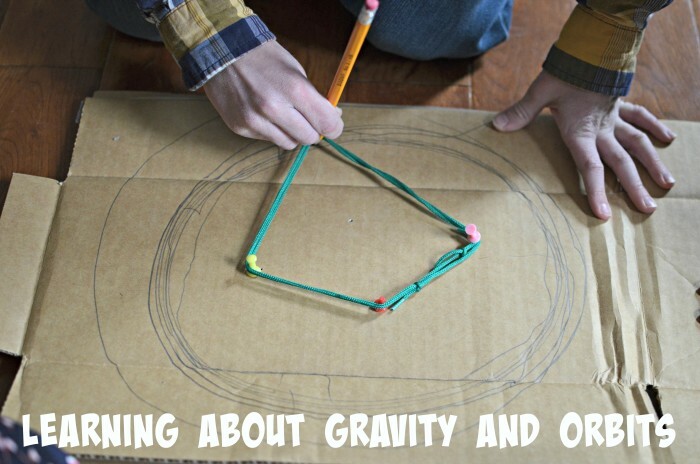 Seeing how the string and our “planets” and “sun” affected the pencils path was extremely effective in helping the kids understand how our solar system works. Overall, I enjoyed our experience with this program. I had expected it to be more independent for the children. When I first looked at the website, I expected them to complete many of the activities online, instead of together with myself teaching the materials, but in the end, I much preferred this experience to what I had expected. I really try and limit screen time for the kids, so using the videos as a tool to teach instead of a means to an end was a refreshing change from many of the other programs on the market. 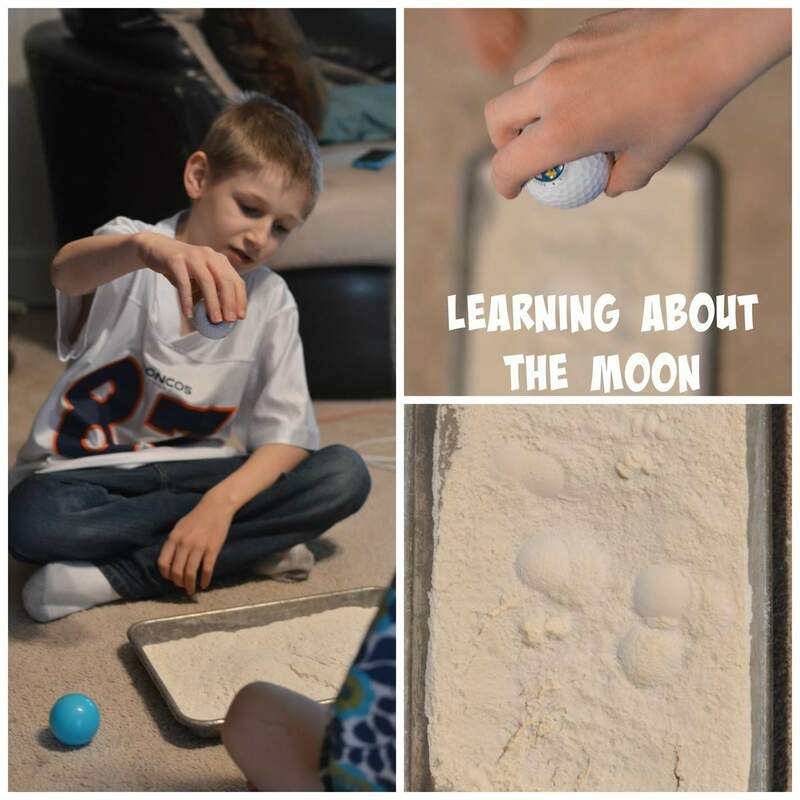 A few of the activities were written for a classroom environment instead of for a homeschool, but it wasn’t anything we couldn’t work with. I would recommend this program to anyone hoping to keep all of their children together in the same science program. I think it would be wonderful for families with visual learners, and those who enjoy worksheet based lessons. This is a fully secular science program, but no where in any of the lessons did I see content that would not be appropriate for homeschoolers from all walks of life and faith.